So, let’s say you zest 10 or 12 Meyer lemons for Organic Meyer Lemon Limoncello, leaving you with a bunch of nekkid fruit. And then? Juice them, of course. And then? Then you have about a pint of Meyer lemon juice. And then? Exactly. Now you have to come up with a way to use up that lovely, fresh lemon juice. 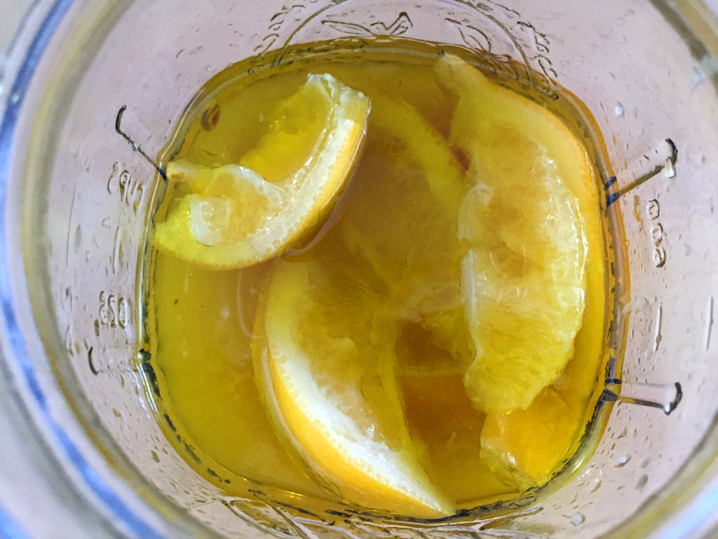 Sure, you can dip into that pint when making salad dressings, lemonade, lemon sorbet, and so on, but what about a recipe that really lets the fresh, unique flavor of Meyer lemons shine — and makes a serious dent in the amount of lemon juice taking up space in your refrigerator? Lemon curd is not a jam or a sauce, it’s actually a custard (although you can thin it with juice or cream to make it saucy). Other sweet treats that are custards? Crême brulée and ice cream, for example. A custard, by definition, is a combination of eggs, milk or cream, and sugar, typically cooked either on the stovetop or in the oven. Lemon curd substitutes lemon juice for the milk or cream and gets its creamy mouthfeel from the addition of butter at the end of the cooking process. 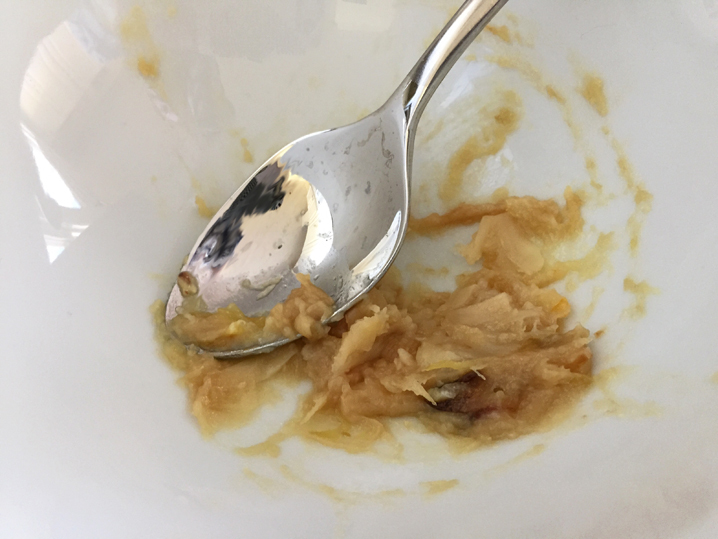 While Meyer lemon curd seemed like a good waste-less solution to too much lemon juice and some eggs that were teetering on being too old to keep around, finding the right recipe was a bit of a problem. 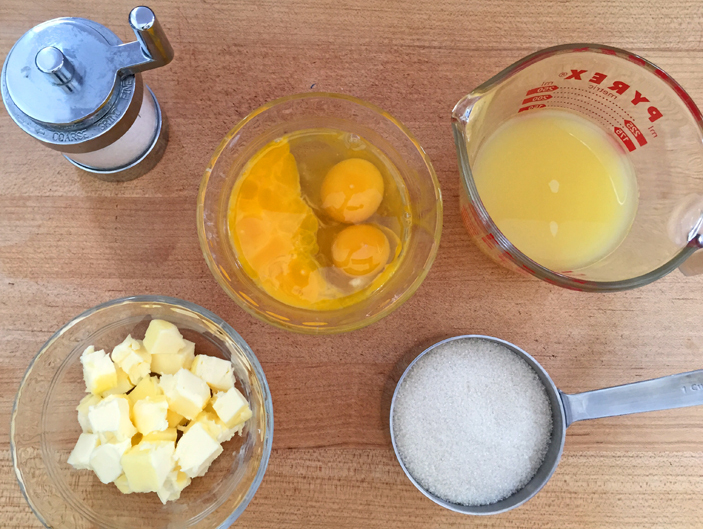 My go-to lemon curd recipe calls for a small pile of zest and egg yolks (not whole eggs, just yolks). Not an ideal solution because I’d end up with leftover egg whites and more nekkid lemons, which meant more juice. Hmmm, this didn’t seem to sit right with the Waste-Less Wednesday mission to reduce waste. I was trying to reduce waste, not create more. So what about that last part — no straining? No, I’m not referring to the amount of physical effort required to make the curd! 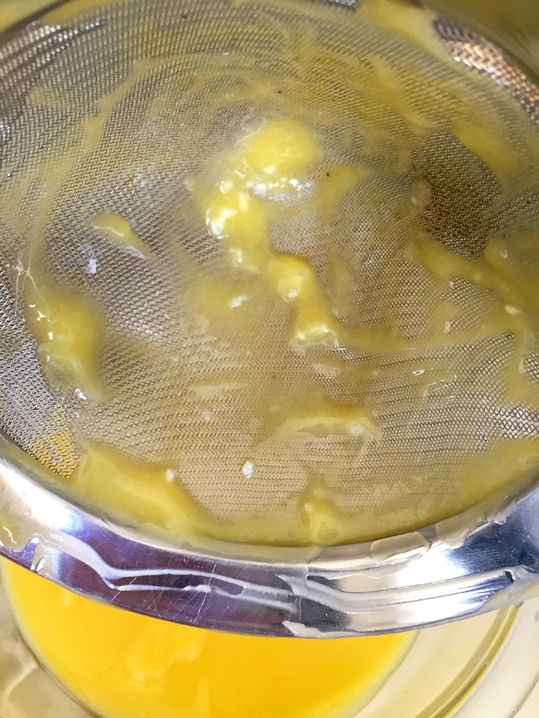 Depending on how you cook the lemon curd, you can end up with some cooked egg bits in the finished curd that you’ll need to strain out if you want a completely smooth lemon curd. Temperature is the culprit here. 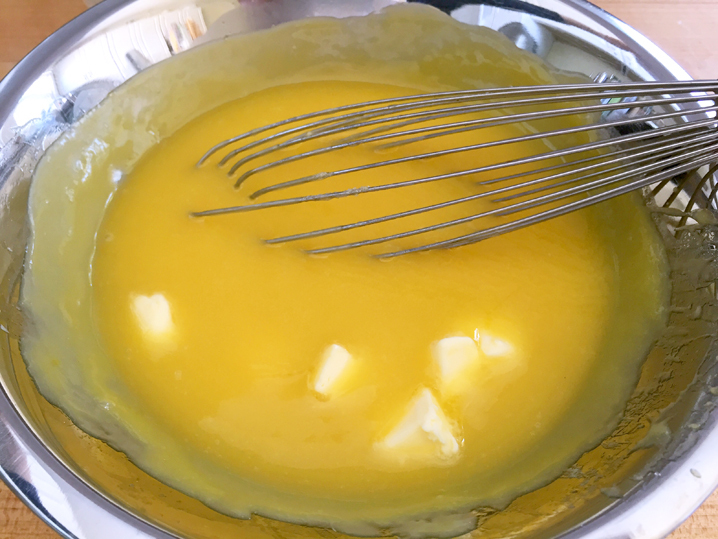 Egg whites cook more quickly than egg yolks, so it’s key that you whisk the egg whites and yolks together thoroughly before you start cooking the curd. Cooking technique is also a factor. 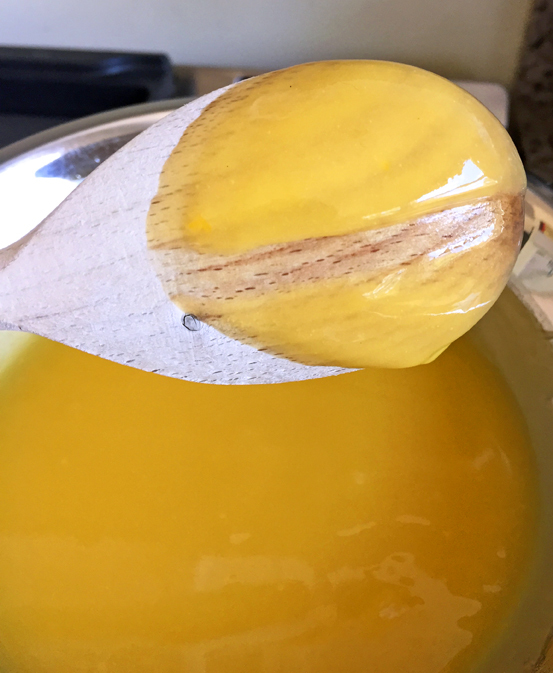 Recipes that call for cooking lemon curd directly over heat (as opposed to in a double-boiler setup) — or even boiling the curd — can result in uneven or too much heat too quickly, causing the eggs in the mixture to curdle. What you need to know about cooking custards is that you want to cook them low and slow — with evenly distributed heat. That’s why custards are often cooked in or over water baths. 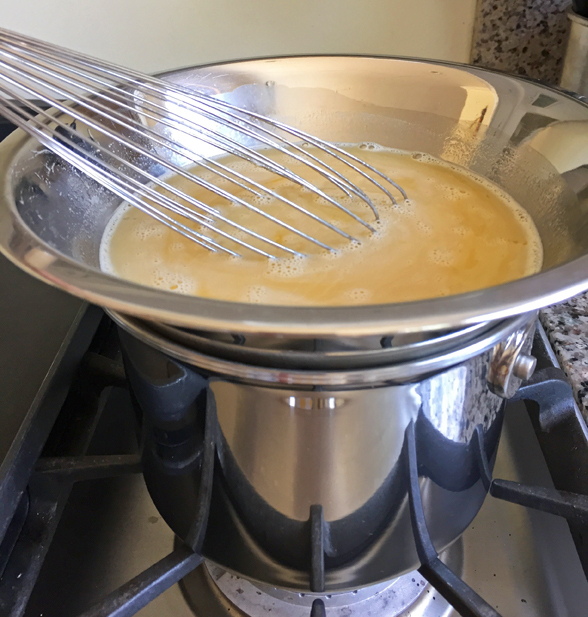 So, really all lemon curd needs is a double-boiler setup and your undivided attention for 10-15 minutes. Ah, where to find this unicorn of lemon curd recipes? 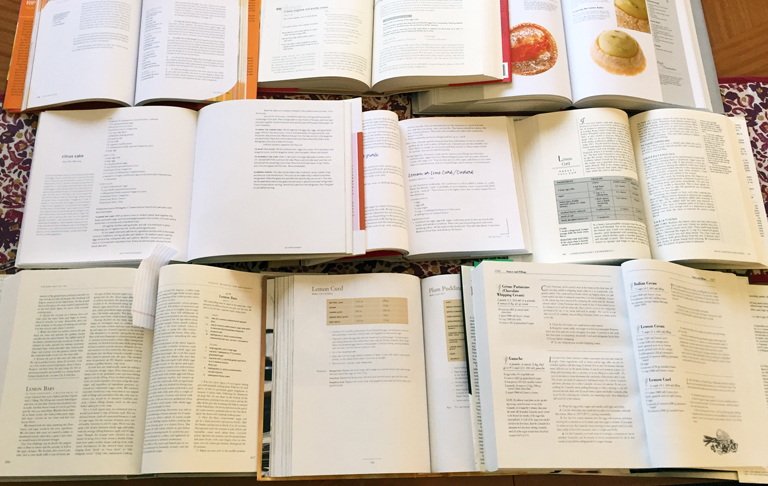 It was a quest — through a dozen cookbooks and magazines and half a dozen online recipe sites. 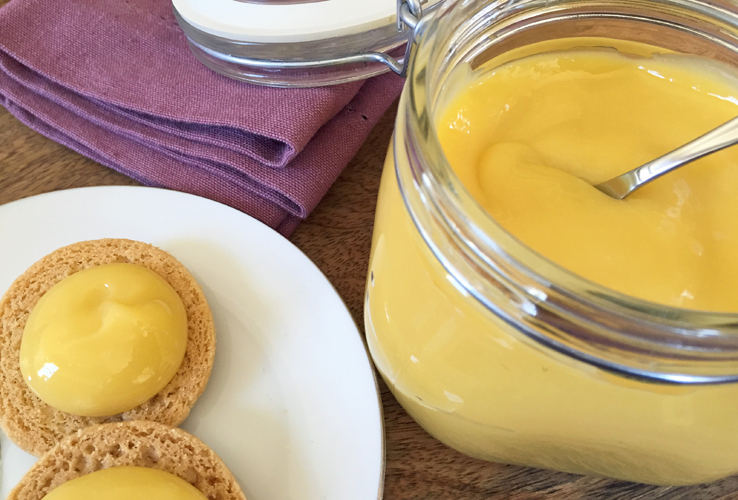 Who knew there were so many different (and yet similar) lemon curd recipes in the world? 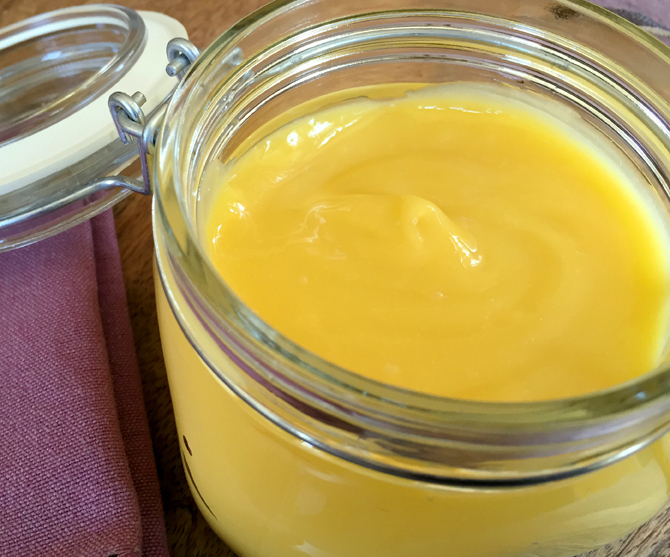 After all of that research, I can’t say that I found one recipe that met my criteria for ingredients and technique together, but I had some reliable sources to draw on for inspiration in creating my own easy-to-make, rich lemon curd. Have you made lemon curd? With or without zest? Strained or not? Share your thoughts and experiences in the column below. Here it is: a zest-free, no-strain, minimal-waste, creamy lemon curd with all the sweet tangy flavor of Meyer lemons. (Note that I do include an optional straining step, in case you need it.) Make sure that you can commit an uninterrupted 10-15 minutes to the cooking process. You need to stir the curd continuously during this time. Serve this luscious treat as a complement to plain baked goods, such as cakes or scones, as a topper for waffles, or with fresh berries. Fill the saucepan with approximately 2 inches of water, cover with a lid, and bring to a simmer. Turn the heat to medium-high. You want to be sure that there’s enough water to keep the simmer going, but not so much that the insert or bowl will be immersed in water when you place it on top of the saucepan. Also, you shouldn’t see any steam coming from the saucepan. If, at any time during the cooking process, steam starts to come out of the saucepan, turn down the heat. Prepare the ice-water bath. Fill the baking pan with a dozen ice cubes and then add enough water to fill the pan about halfway. Place a clean, medium-sized bowl in the baking pan. 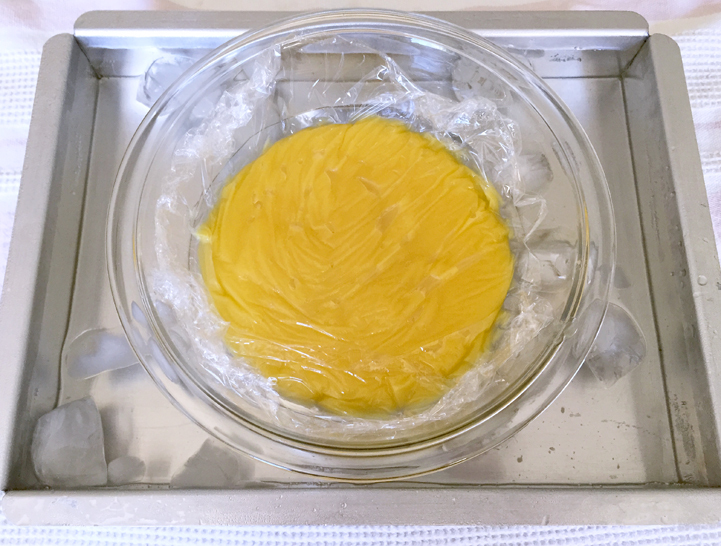 In the other bowl or double-boiler insert, whisk the eggs until yolks and whites are well combined, adding the pinch of salt. Stabilize the bowl or insert by placing a rubber jar opener or folded wet kitchen towel underneath, then whisk in the juice. Pour the juice in slowly with one hand, while whisking to combine it with the eggs using the other hand. For example, if you’re right-handed, pour the juice into the eggs with your left hand, and whisk with the right. 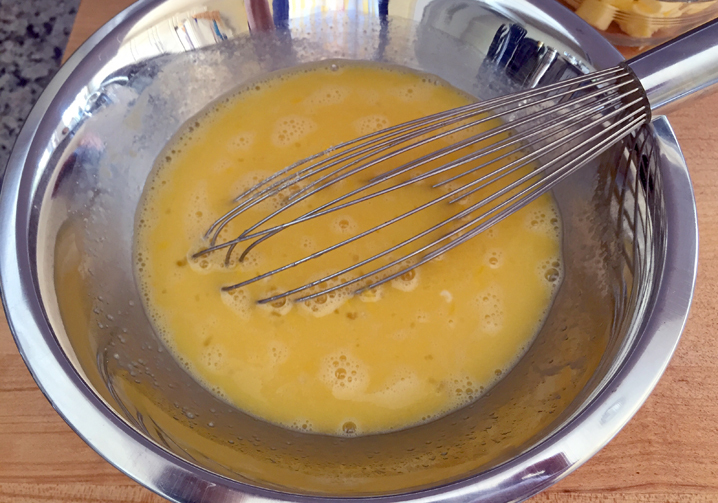 Whisk the sugar into the egg and juice mixture. Use the same technique as you did to whisk in the juice. Place the bowl or insert into the saucepan over the simmering water and, using the whisk, stir continuously for about 10 minutes, until the mixture starts to thicken. For the first five minutes, nothing will happen, but keep stirring at a slow-to-medium pace. Around the 8-minute mark you’ll notice a little thickening, barely. Don’t stop stirring. You’ll want to keep the mixture moving the entire time so it cooks evenly and doesn’t have a chance to curdle. I’m not kidding. Don’t stop. Don’t step away for a minute, or you might end up with lemon scrambled eggs. After 10-12 minutes test for doneness and temperature. You want to cook the mixture until its thickened and an instant-read thermometer reads 175° F.
If you don’t have an instant-read thermometer, try this old-school method of testing doneness: dip the back of a wooden spoon in the mixture. The curd should coat the back of the spoon. If not, keep stirring and cooking. If the spoon is coated, run your finger through the curd that sticks to the spoon. If the gap doesn’t close at all, the curd is ready to come off the heat. Turn off the heat, and remove the bowl or insert, placing it on a folded towel. Add half the butter cubes to the mixture and whisk until completely melted and combined. Then add the other half, again, whisking until completely combined. As the curd cools, it will continue to thicken, so don’t worry if doesn’t seem thick enough now. However, residual heat will continue to cook the curd, so it’s important to bring the temperature down as soon as possible, which is why you want to get the curd into an ice-water bath. 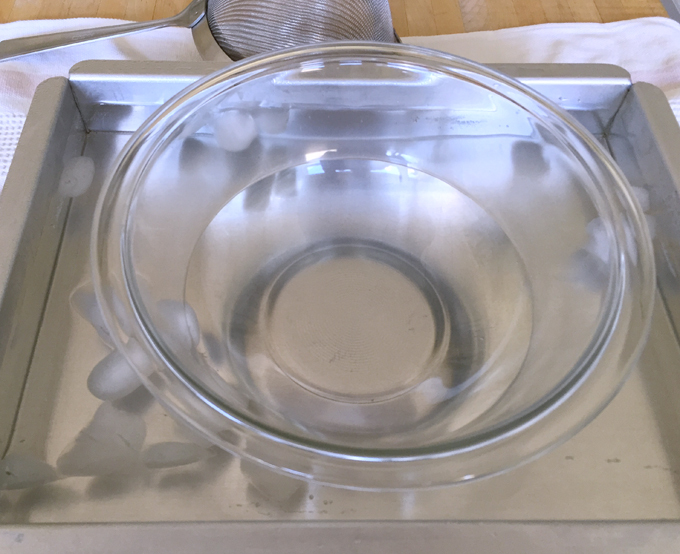 Add the remaining dozen ice cubes to the prepared ice-water bath. Optional: Sometimes you’ll end up with a few bits of cooked egg whites in the curd. If you want a completely smooth curd, you can strain it through a fine-mesh sieve into the bowl in the ice bath. Use a rubber spatula to press the curd through the sieve. I had a few bits of egg white in my curd, but they’re so tiny that I could have skipped the straining. If you skipped step 10, use a rubber spatula to scrape the curd from the double-boiler insert or bowl into the clean bowl in the ice bath. Top up the water in the baking pan so that it’s equal with or slightly above the level of the curd in the bowl. Place the ice bath (with curd bowl) in the refrigerator and allow the curd to cool for 1-2 hours before serving. Store in a covered container in the refrigerator for about 3 weeks. Ah, limoncello! That little glass of sunshine on a cloudy day (or a sunny day, or… any day). Limoncello is lemony-sweet boozy goodness that you can enjoy as an apertif, a digestif, or anywhere in between. If you’ve got some patience, lemons, clear alcohol of at least 80 proof (vodka, for example), and simple syrup, you can make your own limoncello to enjoy whenever. 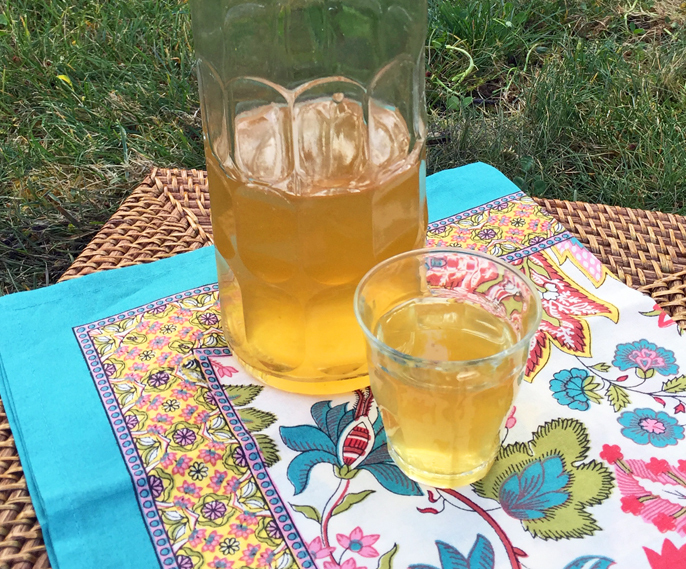 When I wrote about Lemonpalooza earlier this year, one of the projects on my list was to make a tasty organic limoncello. Maybe not the “it tastes just like the one on had in Italy that one time.” But a flavorful, balanced — not too sweet and not too boozy — indulgence, using good ingredients. Deciding on the right combo of lemons, alcohol and simple syrup meant getting into research-geek mode (definitely part of the fun!). I reviewed a variety of recipes from across the interwebs and dug for deets about alcohol content and aging times for liqueurs. Thinking about making your own limoncello? Here are some tips to help you along. While not certified organic, the lemons I get from my backyard and from my neighbors are pesticide-free. In fact, other than the occasional watering — mostly from the little rainfall we’ve had this year — these lemons are just doing their own thing without the help of other chemicals. If you’re trying to follow a healthy, sustainable diet, why not consider doing same with homemade liqueurs? Limoncello made in Italy typically uses Femminello ‘St. Teresa’ lemons. Larger than our local ‘Eureka’, the Femminello’s zest has more lemon oil, which gives Italian limoncello that oh-so-lemony flavor. (Want to know more about Femminellos? Check out scordo.com.) While some of the specialty citrus growers are starting to cultivate Femminello lemons here in California, the fruit aren’t widely available in the market yet. Given the local abundance of Meyers at this time of year (and their unique sweet-tart flavor), they’re a good choice for a 650-style liqueur. Traditional? No. Delicious? Yes. While in research-geek mode, I tracked down at least a dozen recipes from reputable sources. (Incidentally, all of them the best limoncello recipe evah! ) For every best ev-ah! recipe out there, there’s another best ev-ah! that contradicted the previous — particularly when it came to the type of alcohol to use: high-proof grain alcohol vs. 80-proof vodka. Given that I want to know who’s making my consumables, the source of their ingredients, and the distiller’s take on sustainability, I opted for an 80-proof organic vodka that has a clean, neutral finish. Choosing a lower-proof base alcohol also meant that I didn’t have to add as much simple syrup to dilute the alcohol percentage of my finished limoncello. The alcohol content of commercially made limoncellos falls in the 26-32% range (that’s 52-64 proof). That percentage is determined by how much simple syrup you add to the lemon-infused alcohol. Sound complicated? It’s not. The more simple syrup you add, the more you dilute the alcohol, thus lowering the percentage. More simple syrup = less boozy and sweeter. Less simple syrup = more boozy and less sweet. Got it? Taste will rule how much simple syrup you add to your limoncello, but if you want to geek out and make sure you get your limoncello in that 26-32% range for alcohol content, then website LimoncelloQuest can help. The site provides a calculator that quickly figures out for you how much simple syrup to add to your lemon-infused alcohol. Of course, you can skip the calculator and rely completely on your own palate, ‘cos taste-testing is part of the fun of creating your own liqueur. If there’s any downside to making limoncello, it’s the waiting. The infusion process takes about four weeks, then there’s a few more days of waiting after you dilute the infusion with simple syrup. That’s right. More waiting. What I’ve learned is that the last part — that additional week of aging — is key. You have to let the simple syrup and lemon-infused alcohol do their thing in the dark for a few days — better yet, a week. During this time the alcohol will mellow a bit, reducing any harshness. Back in February, I promised that if all went well, I’d post the recipe. 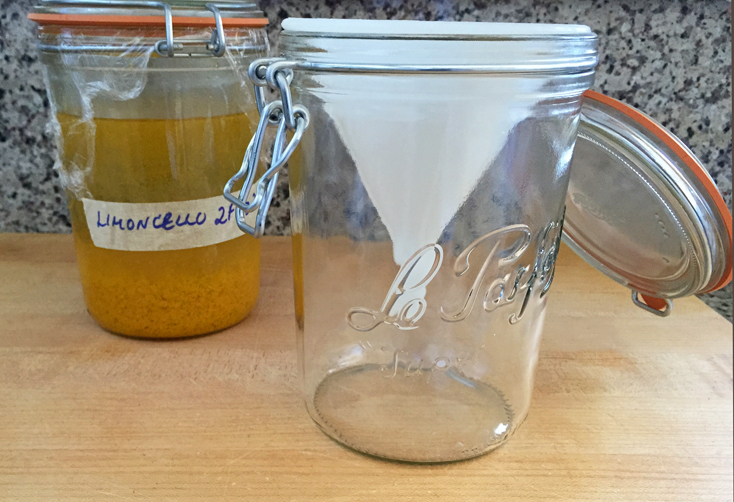 <Drumroll> Well, two months later, and half three-quarters of the bottle gone, here it is: DIY Organic Limoncello. Yield: About 1 liter, depending on the amount of dilution and taste testing. The base alcohol you use matters as much as the lemons, so choose a neutral, smooth vodka that fits your budget and dietary requirements or lifestyle (gluten-free, kosher, grain allergy, etc.). Note that I’ve specified organic cane sugar for this recipe, which produces a richer-flavored and darker-colored simple syrup than you’ll get using refined white sugar. 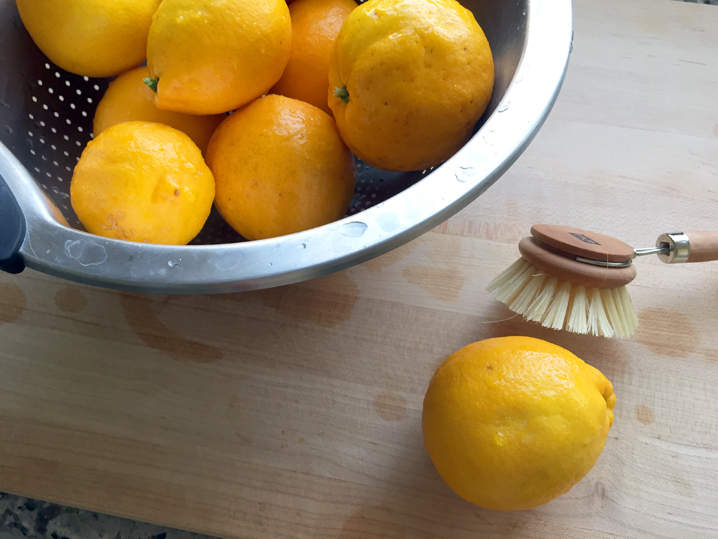 Rinse the lemons to remove any dust or dirt. If necessary, use a small brush to scrub away any dirt or insects that don’t come off easily. 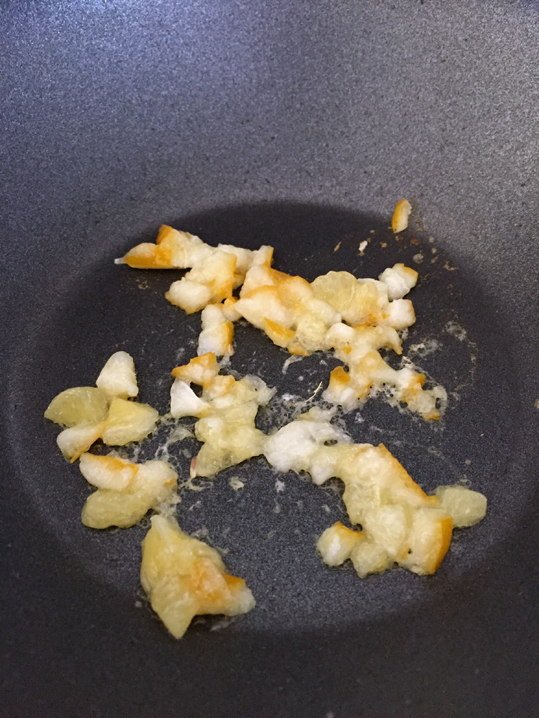 Using a fine zester (Microplane or box grater), zest the lemons. Reserve naked lemons for other uses. 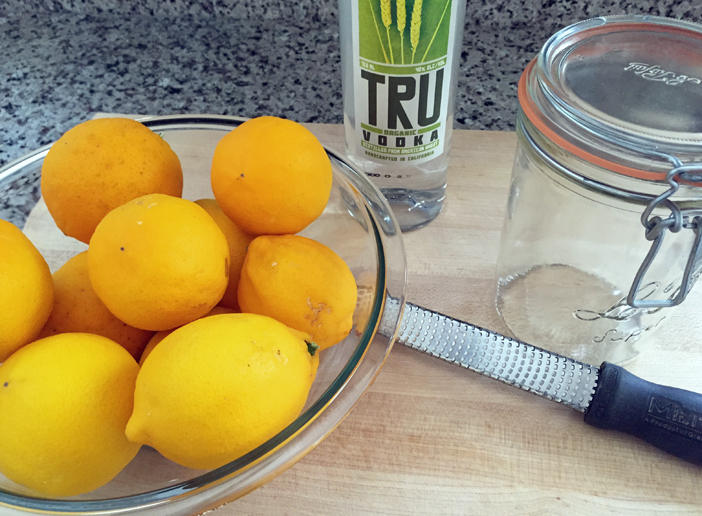 Combine zest and vodka in the jar. Use any jar that has a snuggly fitting lid and a wide-ish opening, such as a mason jar. When the time comes, you’ll have to strain the zest out of the container, and you don’t want to struggle with some narrow opening. Place a piece of plastic wrap over the mouth of the jar. Close the lid tightly and place in a cool, dark spot to infuse for four weeks. Suggestion: Label the jar with today’s date. A piece of masking tape and a Sharpie should do the trick. Create an alert on your calendar for four weeks from now so that you know when to dilute the infusion. Combine water and sugar in a small saucepan and bring to a boil. Remove from heat, cover saucepan, and allow syrup to cool to room temperature before using. If not using immediately, store in a closed container in the refrigerator for up to 3-4 weeks. Note: Simple syrup made with natural, organic sugar has slight brownish hue to it, which will darken the limoncello. 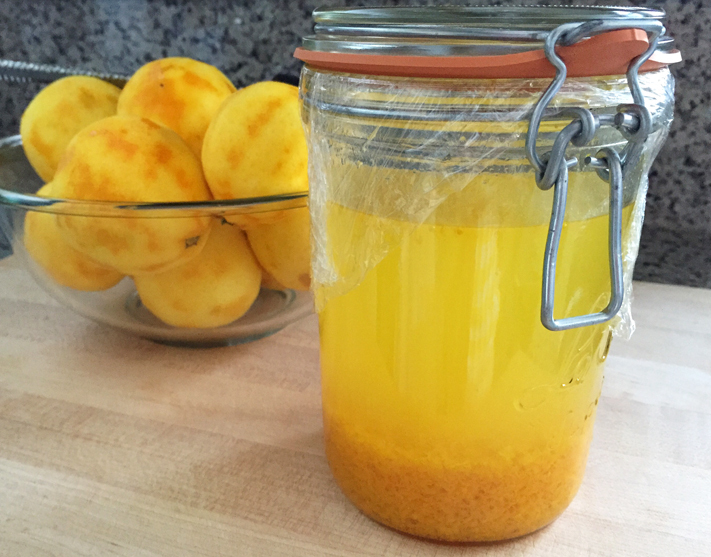 It won’t be quite as day-glo yellow as limoncello made with refined sugar, but I think the flavor is better. Line the funnel with several layers of cheesecloth and place it in the mouth of the clean jar. Pour the infused alcohol and zest into the funnel, straining the zest from the liquid. Squeeze all liquid from the cheesecloth into the jar. Pour 1 cup of the simple syrup into the jar and stir. Taste the mixture. It might taste boozy at this point; the alcohol content will be about 30%, or 60 proof. If you think this might be to your taste, close the jar, and put it in a cool, dark place to age for a week. If, after a week, your limoncello is still too boozy or harsh, you can add more simple syrup at that time. Just give it a few more days to age. If you think you’d prefer a sweeter limoncello, add more simple syrup, two tablespoons at time. Stir, then taste. FYI, I added the full 12 ounces of simple syrup all at once for 27% alcohol content (54 proof) and ended up with the perfect balance of alcohol and sweetness for my palate. I probably could have gone with just a tablespoon or two less, but it’s so damn good! Age your final mixture for a week, then transfer to the final storage bottle or container. Store in refrigerator or freezer. Serve chilled. You might notice a “scum” forming at the top of the container. This is a coagulation of the natural lemon oils in the mixture (it’s flav-ah!). 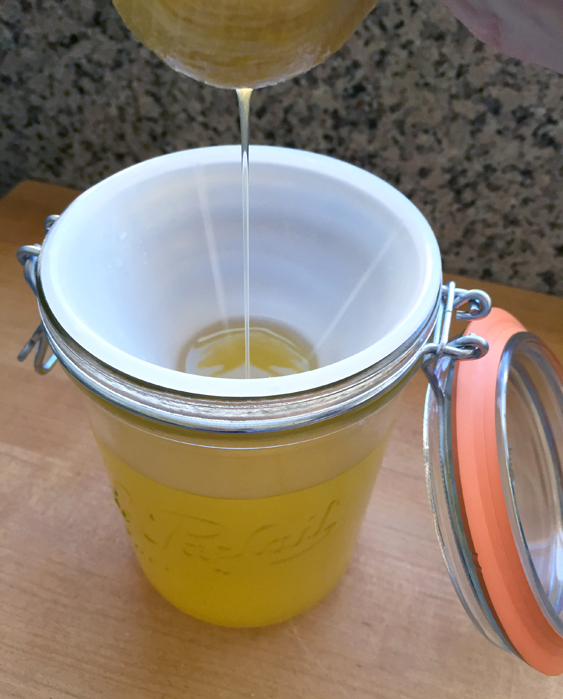 Simply stir or shake the container to redistribute the oils. 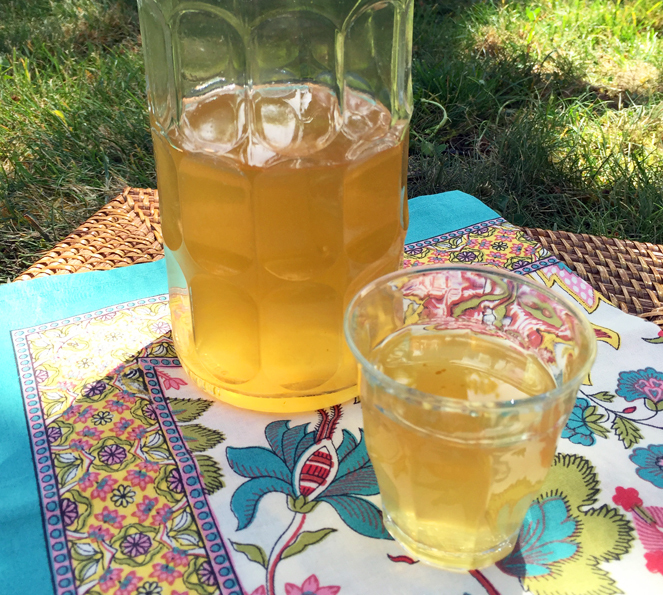 Have you made limoncello? What’s your best ev-ah recipe? Today’s Birthday Week indulgence is homemade comfort food that brings together two recent Waste-Less Wednesday ingredients: lemons and herbs. Remember those 7-Day Preserved Lemons? After a week of climbing the kitchen stepladder to shake those babies up, it’s time to crack them open and take them for a taste test! So… how’d they turn out? Opening the mason jar of marinated lemons after it spent a week in the surprisingly warm upper-reaches of my kitchen, I wasn’t sure what to expect. Would they actually taste ok, or would the flavors be off? Would this be another kitchen experiment to hit the compost bin? The first bite was soft, tart, and salty. The rinds and flesh had softened, but weren’t mooshy, with the lemon flesh coming away from the soft rinds easily. The flavor was definitely Meyer — lemon with a hint of tangerine — and tart, but not puckeringly so. Ooooh, this was gonna be good! (And a little weird when I realized that I was eating wedges of lemon!) I almost forgot the final step of the process, which was to cover the lemons in olive oil to help preserve them in the fridge. So, now I have these salty, somewhat-tart, soft lemons dipped in olive oil. Nothin’ bad about that! Almost forgot to top up the jar with olive oil! 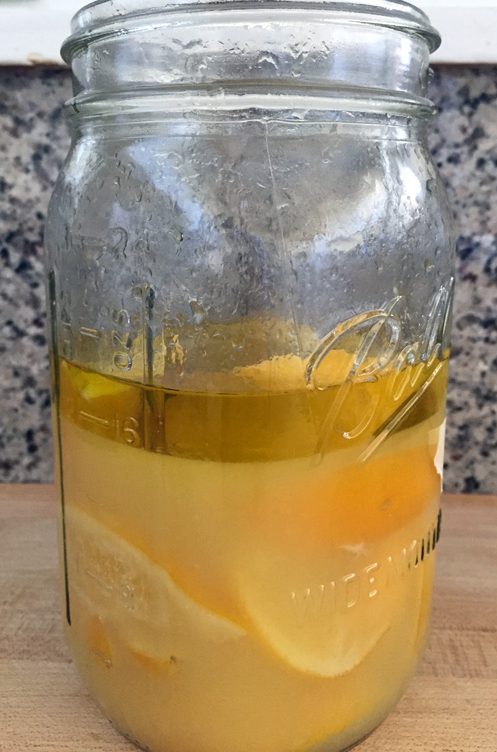 In general, I wouldn’t eat these preserved lemons out of the jar, but I could think of all the ways that they would be a flavorful accent to pasta, fish, or a composed salad. What to make first? 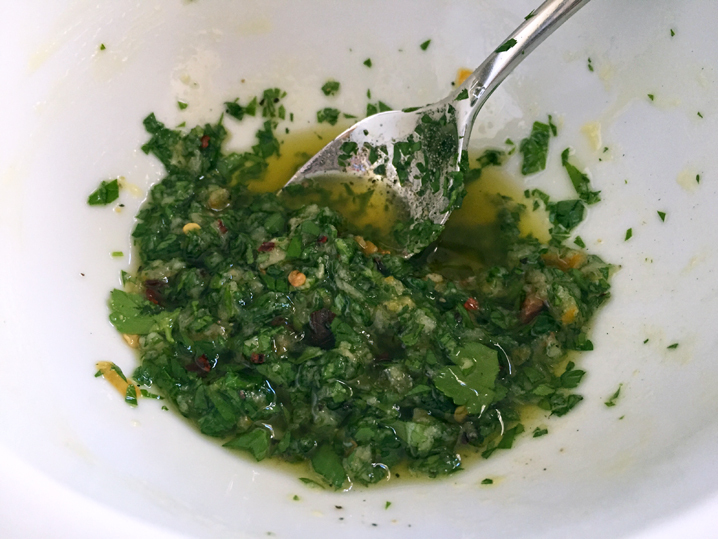 I love the idea of gremolata — a classic Italian condiment of fresh lemon zest, parsley, and garlic — but with a twist. When making the classic version, you’ll get the best results when all ingredients are freshest. But what if your ingredients aren’t super-fresh? How about a variation that brings together roasted garlic, preserved lemons, and minced parsley? Using preserved lemons means that you can use the whole lemon, not just the zest. Roasting garlic cloves lets you extend the life of your garlic, giving it a sweet but complex flavor and soft texture that makes it more versatile. And even less-than-fresh parsley has something to add to this combo! (I’ll confess that I keep my parsley in a ziplock bag for two weeks or more, weeding out the <ahem> discolored or floppy branches. It’s not always pretty, but I’m doing what I can to get the most out of a bunch of parsley.) And the best part is that you can prepare all the components in advance and store them in your refrigerator until you’re ready to put them together! So, inspired by the classic gremolata, here’s my recipe for a homemade mid-week meal that is flavorful, comforting, and indulgent. This pasta is on the lighter side and perfect for a weeknight spring meal or weekend lunch. The recipe makes enough for one person. Double up if you’re cooking for two (or just want some leftovers). Scale up if you’re cooking for a crowd. Feel free to make adjustments to the parsley, garlic, or lemon or amount of pasta based on your taste and preferences. Add a seasonal green salad with grated carrots or tomato wedges to round out the meal. * To roast garlic: You can roast garlic in a toaster oven or toss it into the baking dish when making roasted vegetables in a full-sized oven. Preheat oven to 400° F. Cut the top off a head of garlic and peel away a couple of the head’s outer paper-like layers. Place the garlic head in the center of a 5″ square piece of aluminum foil. Drizzle the garlic with olive oil (don’t douse it) and then fold the foil around the garlic head, enclosing it. Bake for 45-50 minutes or until the cloves are soft enough to pierce with a sharp knife or skewer. Start heating the water for the noodles while you make the gremolata. Review the package directions for the amount of water to boil. 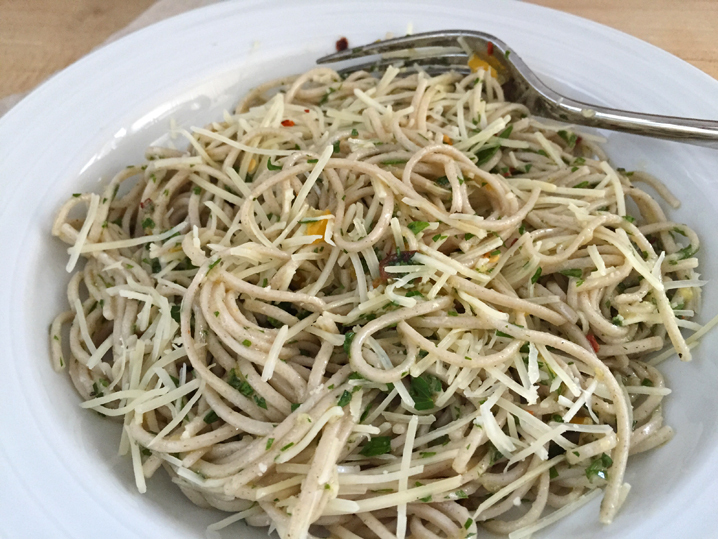 By the time you’ve made the gremolata, the pasta should be ready to go into the pot. Heat 1 teaspoon of olive oil in the sauté pan over medium heat. Add the chopped preserved lemon and sauté for 2-3 minutes until lightly brown and fragrant. Remove from heat. 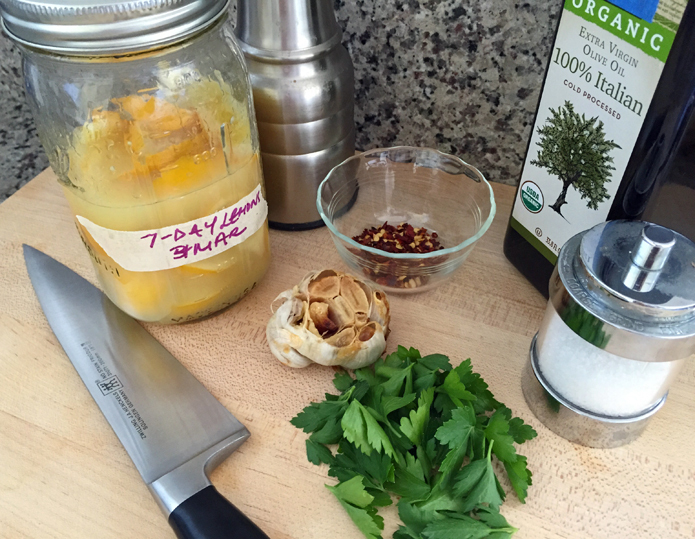 Place the garlic cloves in the medium bowl and crush them with the back of a spoon until you have a garlic paste. Add the olive oil to the garlic paste and mix together using a spoon or fork. Add the parsley, sautéed lemon, and roasted red pepper, mixing to combine. Set aside while you make the noodles. Follow the package directions for making soba noodles. Make sure that you drain the noodles well, removing as much water as possible after cooking. Add the noodles to the gremolata mixture, tossing to coat the pasta thoroughly. Turn out into a serving bowl or dish and sprinkle with shredded cheese. Mmmm… earthy soba noodles with garlicky, lemony, herbal goodness. Want to add to the indulgence? Sprinkle with toasted pine nuts. You are currently browsing the Cook Local category at 650Food.